Post and Rail fencing is probably the most popular type of fencing when a permanent and visible fence barrier is needed to contain and restrain animals. It is often used on roadsides where animals are in fields that border a road. 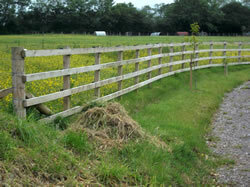 It is commonly used in rural and equine situations to fence in animals or border an access way. It has a pleasing aesthetic look and can be easily used to mount wire stock fence to and also allows for easy electric fence mounting. The posts are more often wooden 1.8 to 2.4m long, 75mm x 125mm to 75mm x 150mm (6' - 8' long, 3" x 5" - 3" x 6"). 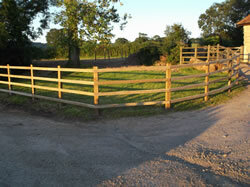 However, depending on situation, posts can also be round stakes, cleft/split chesnut or concrete. Rails can vary from a square section 3.6m long, 38mm x 87mm to 47mm x 100mm (12' long x 3 1/2" x 1 1/2" to 2" x 4" nominal) to half round sections and cleft/split chesnut. 2 rails are the most popular, but as the pictures illustrate a 4 rail fence may be required. The top rail is usually 1.2m/4ft from the ground. For a 4 rail fence it is standard advice to use a 2.1m / 7' plus post, as opposed to the most popular 1.8m / 6' post used on a 2 rail fence.